We’ve just given our messaging system an overhaul and changed up our layout for sending and receiving cards, allowing you to add a note onto our eCards for special occasions and holidays. This is the page that you will see when you are done creating an eCard. It is ready to be sent! 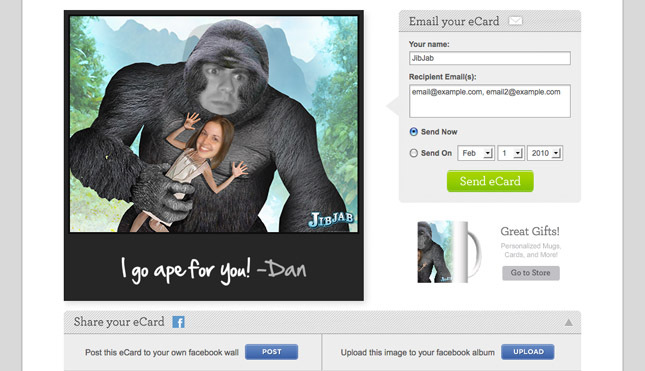 And this is what the person receiving your eCard will see. Clean, crisp and to the point! So what does this mean for you guys? Well, for one, sending still images is a lot more fun when you can add your own message in! The best way to see how we’ve restructured the cards is to try one out, and there’s no better area to give it a go than within our selection of new Valentine’s Day eCards (more on these this week). Spread the love! 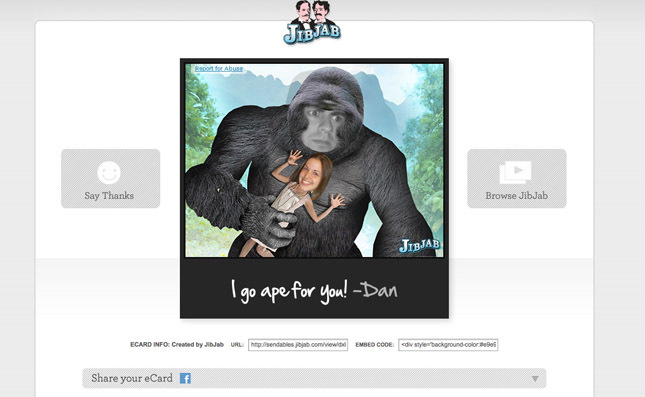 This entry was written by paulhanges and posted on February 1, 2010 at 8:05 pm and filed under Inside JibJab, New Content. Bookmark the permalink. Follow any comments here with the RSS feed for this post. Trackbacks are closed, but you can post a comment. Very nice! Can’t wait to try it out! I’m one of your biggest fans, just ask my friends that I’ve jib jabbed!